Our organization holds expertise in offering an exclusive range of Marble Inlay Dining Table to our clients. These Black Dining Table Top are manufactured using best grade marble, sourced from certified vendors in the market. Furthermore, we provide customized solution to our clients as per their requirement. These Dining Table Marble Tops are available in the market at the most competitive rates. 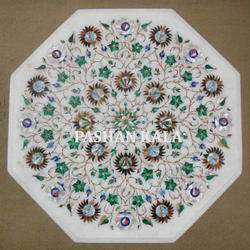 We provide White Marble Dining Table that is authentically designed with inlay art work. 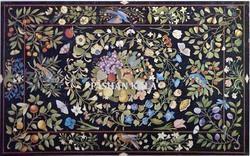 The Inlaid Table is impressively decorated by the skilled craftsmen of our organization. This specially designed marble top has a class and elegant touch and can be used in the home as the base stand on marble. Further it can also be used in offices to give a aesthetic look to the surrounding ambience. We offer these at reasonable prices with long lasting shine and durability. Exclusive range of White Marble Inlay Table that we offer is designed as to meet the requirement of Domestic and commercial room and is provided as per the need of client. It is offer in attractive color and size. We supply this Marble Top Dining Table throughout the world. Further, our range is highly appreciated by a large number of clients owing to its high durability and optimum quality. 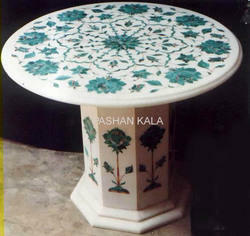 We are known as the leading manufacturer and exporter of an exclusive range of octagonal marble table tops. 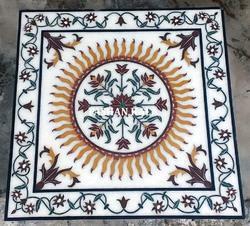 With the help of our expert craftsmen, these inlay table tops are fabricated using high quality raw material. Our range of these coffee table top is well known in the market for its optimum quality and durability. They are available at customer friendly rate. We are engaged in manufacturing and exporting extreme quality Rectangular Marble Table that are manufactured using premium quality raw material. We offer these Dining Table Top in rectangular shape and attractive design and color. We charge reasonable rate with our buyer. 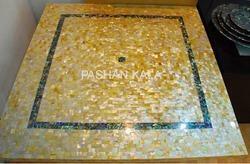 We also offer premium quality stone products which includes Stone Inlay TableTop with interactive range of color. We offer shiny, intricately designed and perfectly carved Stone Dining Table Top. 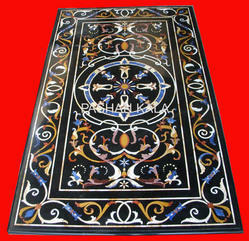 Specially carved, available in various pattern and designed with using exclusive color. 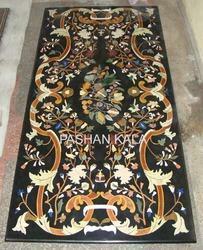 We are offering these Inlay Table Top at reasonable price in market. We are providing the fine quality of Mother Of Pearl Table Top that is processed under the guidance of our expert supervisors. These products have smooth texture but they are not slippery. These products have various natural shades that bring natural feeling to our clients. With the large distribution network, we ensure the on time delivery of the products. We assure the superior quality of products. • Size : 12 x 12, 15 x 15, 18 x 18, 24 x 24, 30 x 30, 36 x 36, 42 x 42, 48 x 48" Inch and any customize size as per requirement. Looking for Marble Inlay Table ?